They can pretend to chase him around from cave to cave for the next 30 years; spreading DU, dead children, and hell and safeguarding the drug flow into the streets of broken down amerika, stuffing the pockets of arms dealers, heroin pushers and pipeline contractors. The top US commander in Afghanistan has said al-Qaeda will not be defeated unless its leader, Osama Bin Laden, is captured or killed. Testifying to US Congress, Gen Stanley McChrystal said Bin Laden had become an "iconic figure". He said President Barack Obama's deployment of 30,000 extra troops to Afghanistan meant success was possible. But he said the mission was "undeniably difficult" and the next 18 months would be crucial. "I don't think that we can finally defeat al Qaeda until he's captured or killed," said Gen McChrystal of Bin Laden. "I believe he is an iconic figure at this point, whose survival emboldens al-Qaeda as a franchising organization across the world," he said. The general said that killing or capturing Bin Laden would not spell the end of al-Qaeda but that the movement could not be eradicated while Bin Laden remained at large. The militant leader is believed to be living in the border region between Pakistan and Afghanistan. US Secretary of Defense Robert Gates said last week that officials have had no reliable information on Bin Laden's whereabouts for "years". Gen McChrystal told the Congressional hearing the next 18 months would be crucial in Afghanistan, but that he did not expect to need more troops to get the job done. He said coalition forces faced "a complex and resilient insurgency" and that Afghans lacked confidence in their government. "Success will require steadfast commitment and incur significant costs," he told the House Armed Services Committee. The commander said the 30,000 US reinforcements would "provide us the ability to reverse insurgent momentum and deny the Taliban the access to the population they require to survive". He said he did not think he would need to ask for any more troops in a year's time, but would not hesitate to recommend more if circumstances changed. The US ambassador to Afghanistan, Karl Eikenberry, who reportedly questioned the troop build-up during White House deliberations last month, also endorsed the new approach as "the best path to stabilise Afghanistan". Mr Eikenberry agreed with Gen McChrystal that Bin Laden was key that process. He said it was "important to the American people - indeed, the people of the world - that one day Osama bin Laden is either captured or killed, brought to justice". The new battle plan includes an 18-month timeline before the first US troops would begin to come home. Hours before the panel convened, Mr Gates held talks with Afghan President Hamid Karzai in the capital, Kabul. Speaking at a joint news conference afterwards, President Karzai warned that it would take 15 years before Afghanistan was able to pay for the cost of its own security forces, which the US wants to quadruple in size to 400,000 troops by 2013. "We hope that the international community and the United States, as our first ally, will help Afghanistan reach the ability to sustain a force," he said. For his part, Mr Karzai said he hoped the US and the international community would continue funding them, adding the US would not abandon Afghanistan. The two countries would need to be long-term partners, he said. The defence secretary said Mr Karzai needed to take a tougher line on corruption, but added that many ministers were competent and did not need to be replaced when a new cabinet is announced in the coming days. Mr Karzai said he was committed to doing so and that he would inform parliament of the names of a number of proposed ministers. Both men then agreed that it was a priority to strengthen the Afghan security forces in order to help international troops tackle insurgents. But Mr Karzai was also cautiously optimistic that his country would be able to begin taking over responsibility for security in some "critical" parts of the country within two years, before taking charge nationwide in five years' time. The president later condemned what his office said was the killing of six civilians in an overnight operation by Nato-led forces in the eastern province of Laghman. Robert Gates: "We know that you prefer to have Afghans protecting Afghans"
Local residents have protested against the reported civilian deaths, which they and provincial officials say number 12. The Nato-led International Security Assistance Force (Isaf) said its troops killed seven militants and detained another four after coming under hostile fire while pursuing a member of the Taliban responsible for suicide bombings in the area. Meanwhile, in a sign of the country's security difficulties, there were reports on Tuesday that Afghan officers had opened fire during a protest by villagers over the deaths of civilians, which they say occurred during a Nato operation. According to one report, the Afghan soldiers fired into the air, but at least one person was killed. That guy's long dead. Bhutto said so, now she's dead too. Osama bin Laden's older brother Salem, once head of the wealthy Saudi family clan, was a former business associate of George W. Bush. Salem bin Laden, one of 57 children their father Mohammed sired with his 12 wives, and Bush were founders of the Arbusto Energy oil company in Texas. He died in a plane crash in 1988, but not before the Arbusto Energy Oil Company, founded in 1978, had become hugely successful. The bin Laden brothers inherited a fortune from their construction magnate father. He left millions to each of his many, many children after dying in an air crash in 1968. Salem put a large part of his money into business ventures, including Arbusto Energy. At the time, Bush was not long out of Harvard Business School. 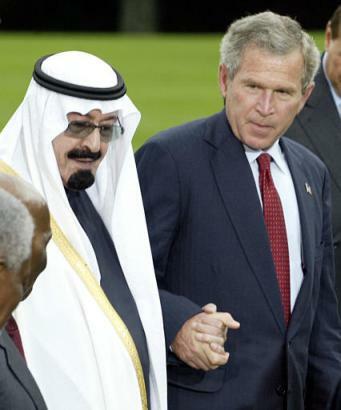 As he built his business empire, Salem Bin Laden had an intriguing relationship with Bush. In 1978, he appointed James Bath, a close friend of Bush who â€œservedâ€� with him in the Air National Guard, as his representative in Houston, Texas. It was in that year that Bath invested $70,000 in Bush's company, Arbusto. It was never revealed whether he was investing his own money or Salem's. The same year, Bath bought Houston Gulf Airport on behalf of the Saudi Arabian multi-millionaire. Salem was the head of the bin Laden family as the oldest of all the brothers and sisters, and a man with a powerful presence. The FBI in Boston has long been aware of bin Laden's extended family and began monitoring their activities after the 1998 terrorist bombings of U.S. embassies in Africa. PARIS, Oct. 31 (UPI) -- A CIA agent allegedly met with suspected terrorist mastermind Osama bin Laden in July, while the Saudi underwent treatment for kidney problems at an American hospital in Dubai, France's Le Figaro newspaper reported Wednesday. Bin Laden reportedly checked into the American Hospital Dubai, a 100-bed, acute-care general hospital, July 4 and stayed until July 14. He arrived from Quetta, Pakistan, accompanied by his personal doctor and a close aide -- possibly Ayman el Zawahiri, a leader of Egypt's Islamic Jihad, now bin Laden's right hand man, the newspaper said. Le Figaro cited a "professional partner" linked to the hospital's management as its source. Besides a stream of local dignitaries and family members, bin Laden's visitors included a local CIA agent, the newspaper reported. The agent was widely recognized locally, Le Figaro said, and later told several friends of the meeting. The alleged American spy was called back to the CIA's McLean, Va., headquarters July 15 -- a day after bin Laden checked out, Le Figaro reported, citing "authorized sources." Why bin Laden would have met with a CIA officer -- or vice versa -- is unclear. Even before the Sept.
11 attacks on the United States, the Saudi millionaire figured among America's top terrorist suspects, blamed for several earlier plots against U.S. targets, including the 1993 World Trade Center bombing. But the French newspaper asserted CIA-bin Laden links stretched back years, and appeared to suggest bin Laden gave the agency information regarding future terrorist strikes. "The Dubai meeting is therefore a logical follow to a "certain American policy," the newspaper said. In particular, the newspaper noted that just two weeks after bin Laden checked out of the Dubai hospital, United Arab Emirates security agents arrested the alleged mastermind of a plot to blow up the American Embassy in Paris. The suspect, a French-Algerian named Djamel Beghal, earlier confessed to receiving his orders from bin Laden, according to French news media citing his written confession. An American diplomat in Paris refused to comment on the Figaro article, or on reported allegations of an emergency meeting in Paris in August, between high level French and American intelligence officials. "We're just not comment any of that stuff," he said. "We can't talk about meetings like that may or may not have happen." Le Figaro said bin Laden had serious kidney problems, and reportedly had a dialysis machine imported to Afghanistan last year. Citing a March 2000 report by Asia Week, the newspaper said bin Laden's illness stemmed from "a renal infection that has spread to the liver, and needs specialized treatment." The head of the Dubai hospital's urology department, Terry Callaway, reportedly refused to answer questions about bin Laden's alleged stay. Radio France reported Wednesday the American hospital has denied bin Laden was treated there. Right, an icon of racist propaganda to justify war. I laugh my a$$ off when the media mentions Bin Laden. I can't wait for his next video message. We're chasing a dead man and we still can't capture him. They might as well just say "Boogie Man" instead of "Bin Laden". Same thing - and same chance of actually catching him. Ya, you hit on it. If this guy is alive he is very well protected by our elitists and their lackeys. Or he may be in Kennybunk Maine, having a reunion with the Bush clan. "Osama bin Laden may be slipping back and forth from Pakistan to Afghanistan. Or the U.S. might not have a clue, more than eight years after the al-Qaida leader masterminded the terrorist attacks on America." It's hilarious how we go months and even some years without hearing anything about Bin Laden, then out of nowhere we start hearing stuff about him every day or so.. Seems like something is about to go down. Isn't this the 6' 5" guy who needs KIDNEY DIALYSIS - and we can't track him down? There's a 10M bounty on this guys head and nobodys talking,,,,DUH. Let's just sic "DOG" the bounty hunter on him. Remember how in 2007 they released a supposed video of bin Laden where his beard was black even though it was grey in the earlier footage of him?